Smith College Tennis Team nailed down their first win of the season with one doubles and five singles wins in a 6-3 win over Clark University in the New England Women's and Men's Athletic Conference finale on Tuesday afternoon. Smith trailed 1-2 after doubles play, with only the duo of Nikki Anderson and Maggie Steiner recording a win. The pair topped Clark's duo of Julia Bergeron and Emily Schweitzer 8-5 at No. 2 doubles, while Clair Oblamski and Eunice Zhao came close to recording their third straight win at No. 3 doubles, falling narrowly to Maggie Swann and Olivia Levin 8-9 (5-7). The Pioneers battled down to the wire in singles . Jaimi Inskeep was pitted against with the toughest competition as she faced Gaby Suriano, a top ranked junior out of Ecuador. Inskeep played with heart but was only able to earn three games. Teague knocked off Bergeron 6-2, 6-2 at No. 3. Oblamski also won by a 6-2, 6-2 count defeating Swann at No. 4. Steiner was the third Pioneer to win by a 6-2, 6-2 score cruising past Olivia Levine at No. 5 . The singles wins gave Smith a 4-2 lead with only one more win needed to give the Pioneers the victory. Anderson and Zhao held everyone in suspense as each battling on their respective courts. 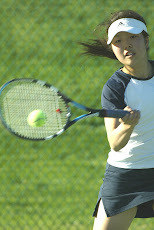 Eunice Zhao; however, brought in the winning point with a 6-2, 6-3 win at No. 6. , Nikki Anderson followed suit by edging out Sarah Sachs 6-2, 7-5 at No. 2 singles, The exciting match ended in a 6-3 victory for Smith. Smith will take part in the New England Women's Intercollegiate Tennis Tournament, from October 15 through the 17.